I never would have thought it was possible! I've been working on the same project for weeks. 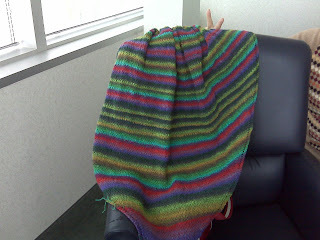 I took this picture last week when I was almost all the way finished with the third skein of Noro Sock yarn. I also took this picture so Bezzie could see my Imaginary Friend Tish. See. She isn't a figment of my imagination at all! She. Is. AaaaLIVE!!!! Another event of note that happened this week... A male co-worker came over to me yesterday and asked "Do you have any yarn with you today?" Notice he was smart enough to know I have yarn with me most days. I said I did and he asked if he could have a bit of it because he wanted to use it to tie a report together. He took about 2 feet of sock yarn and looped it through the 3 hole punches and made little bows on his copy of a report that went out to the client earlier that day. I think the poor guy lost his marbles. But it was really funny. Faking your death, even on the internet, is just asking for some really awful karma. The End. Kids ask the damndest questions! What happened to Bambi’s mommy? I have been spared the “How did I get in Mommy’s tummy” question. THANK GOD! My SIL was ready to give me books on how to answer that one. I think they asked my brother instead of me. This past Friday evening I got to hang out with the nephews. We went to Ruby Tuesdays (even tho it was a Friday and, as DN#2 pointed out, we should have gone to Fridays). When we got back to their house, we watched a DVD. My brother is trying to expose them to more PG-13 type movies. Ones that they’ve told him their friends have seen. So we watched Dodgeball. This was about the 7th or 8th time they’ve watched it. I came up with a lame answer about girls who spend all their time with guys, and they seemed to buy it. I've been harboring a cold with a nasty cough and although I went to the doctor and got the good meds, it seems to be coming back. Ick! "I'm ignoring the grape comment"